What is the future of Spanish in the United States? 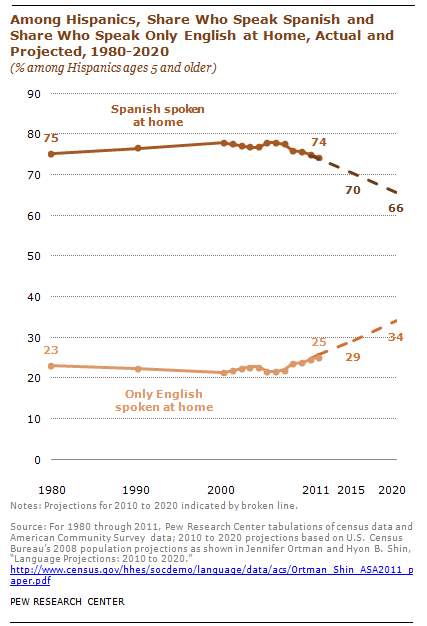 With more than 37 million speakers, Spanish is by far the most spoken non-English language in the U.S. today among people ages 5 and older. It is also one of the fastest-growing, with the number of speakers up 233% since 1980, when there were 11 million Spanish speakers. (The number of Vietnamese speakers grew faster, up 599% over the same period). Nonetheless, the path that Spanish takes could be different. A 2012 Pew Research Hispanic Trends Project report showed 95% of Hispanic adults—including those born in the U.S.—said it is important that future generations of Hispanic speak Spanish. And today’s young Hispanics are more likely than their parents to say they hear messages about the importance of speaking Spanish. But among Hispanics, use of English when consuming news media, television entertainment, music or speaking it is on the rise.